Nothing says interprofessional networking like a rousing game of rock-paper-scissors. That venerable classic was among a slew of old-fashioned and sometimes zany games featured in the 3rd Annual Allied Health Games, which the School of Health Professions hosted on April 22. Seven teams participated in the games. 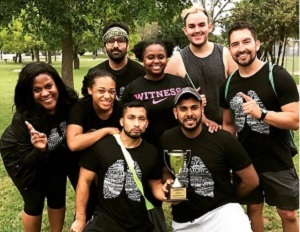 The RespiRiders, from the Respiratory Care program, took 1st place after winning the relay race to break a tie with 2nd place finishers, the MOHOmies from the Occupational Therapy program. The other competing teams included 3rd-place finisher dysFUNCTIONAL, from Abilene Christian University's Occupational Therapy program; The Recollects from Medical Laboratory Sciences program, Straight Outta Briscoe from Physician Assistant Studies program; Occupational Hazards from the Occupational Therapy program; and Prime Time, a team composed of students from Physical Therapy, OT and PA programs. "Everyone seemed to enjoy the games we incorporated and enjoyed the breakfast tacos and pizza provided, " Shelley Mendel, a second-year graduate OT student and a co-leader of the games, wrote in an email. She noted that the cool, windy weather was better than the wet weather that greeted last year's event. The games included a sacks race, three-legged race, egg-spoon race, Jenga, musical chairs, limbo, donut-on-a-string eating contest, "Hungry Hippo," rock-paper-scissors, kickball and the allied health relay race featuring stations representing each profession with the School of Health Professions. Other student organizers of the event include graduate OT students Stacy Larson, Kristen Barnes, Becky Liu, Sonali Patel, and Olivia Dominguez. "We could not have done it without our amazing volunteers," Larson wrote in an email. "It went very smooth and I think everyone had a great time. I really loved that one team was truly interprofessional with OT, PT and PA students. It allowed everyone to take a break from studying and develop teamwork among students."